Very pretty. I love all the cably goodness! The scarf is lovely, but it looks wooly and hot. I feel like all I do is whine about the weather. Too cold, too hot, too rainy, too dry. Whine. Whine. Whine. Love, love LOVE it! That's all I'm going to say!!!! oh those cables are gorgeous! I love knitting cables. I have to concentrate a lot but once finished I always loved the finished product so much. And your work is always so beautiful. Your secret project is looking very pretty...I wonder what you are you to? 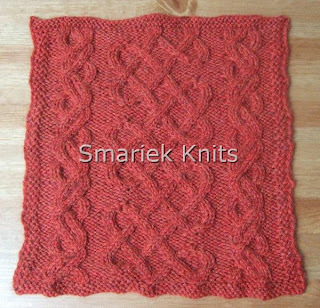 I love the cables on your secret project, very pretty.